Pencil, pen & ink, watercolour, and black marker pen on paper. 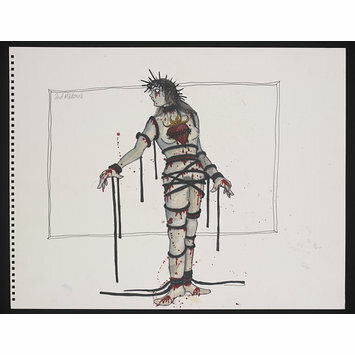 Costume design for the Second Madonna. The design depicts a full length female figure whose naked bleeding limbs and torso have been bound with ropes. The figure wears a crown of thorns on her head. Unsigned by the artist. Costume design by Lez Brotherston for the Second Madonna in the opera "Cornet Christoph Rilke's Song of Love and Death", Glyndebourne Touring Opera, Sadler's Wells, October 4th 1993.